Wright State School of Professional Psychology students Tawana Jackson, left, and Tawanna Howard received state funding to host additional community programs on postpartum depression among African-American women next April. 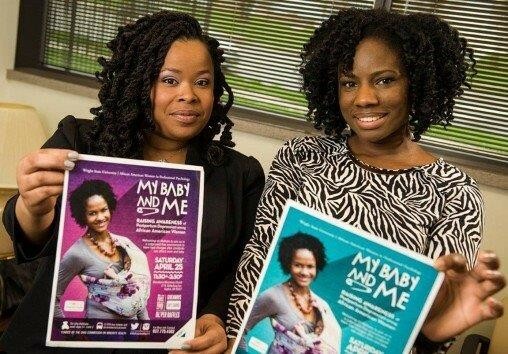 A project to raise awareness about postpartum depression among African-American women has gotten a booster shot, winning state funding that will enable two students from Wright State’s School of Professional Psychology to again host community programs on the topic. Tawana Jackson and Tawanna Howard received a grant for a second year from the Ohio Commission on Minority Health for their “My Baby & Me” programs. The money will enable the students to host two programs during Minority Health Month next April. Last April, the programs drew more than 100 women and children. Howard said the funding demonstrates the commission’s commitment to help educate and serve underserved populations. “Once again we aim to reach women and families who are at risk for mental and medical health issues related to parental and environmental stressors,” she said. The programs are free and open to the public. In addition to mothers, relatives and caretakers are also welcomed. Postpartum depression is a type of clinical depression that can affect women after childbirth. Symptoms may include sadness, anxiety, irritability, low energy and changes in sleeping and eating patterns. “Sometimes postpartum depression can impact a mother’s ability to bond and connect with her child, which would then not only impact that relationship but the child as they begin to develop,” said Howard. Jackson said postpartum depression is underdiagnosed and underdetected in the community. And the Dayton area has one of the highest infant-mortality rates in the nation, she said. The two students, who are both pursuing their Psy.D. degrees, will educate program attendees on postpartum depression as well as offer prevention measures and community resources. Mothers who attend the program have the option of being assessed for postpartum depression. In addition, attendees will be screened before and after the programs to measure to what degree they gained knowledge and skills.